Finally to my surprise check was no good.Finally I contacted Jim Willden to see what was going on.Furthermore he informed me that since the check was late he decided to stop payment in case it had fallen into the wrong hands. Now Im really skeptical and red flags are going up again.As a result He informed me that another check would follow, however it never showed up. I then contacted him again and his response was, we changed our minds. Then figured out what the scam was. They wanted me to ship the sign before their check cleared my bank account, as James Willden told me he needed this sign right away in our preliminary phone conversation. Hence, it was another failed scam & I only lost about $50 in materials & a whole day of work for me and my wife. James Willden, Lori Willden, Vintage Signs, Old Signs…. I will list some of these scammers & thieves eBay user names below.Also many are from India however there are many here in the USA. They are selling these new & fantasy signs as being.Also Below are User names of these rip-offs.I could make this list into the 100’s, so I hope you get my point…. 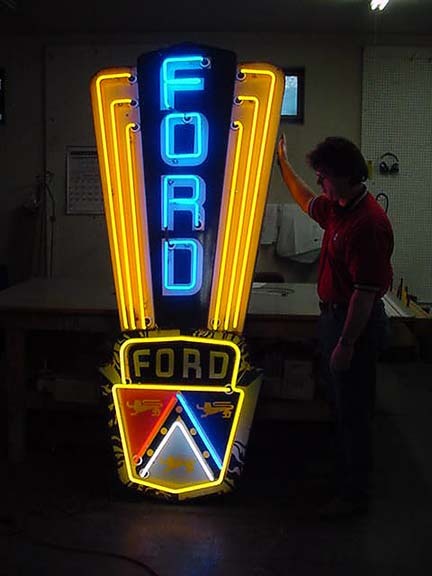 OLD SIGNS, VINTAGE SIGNS FOR SALE, ANTIQUE SIGNS…Vintage Porcelain Neon Signs……. Beware and do your homework about these signs, or you could get ripped off. Buy from a reputable seller, read their feed back & do your homework.